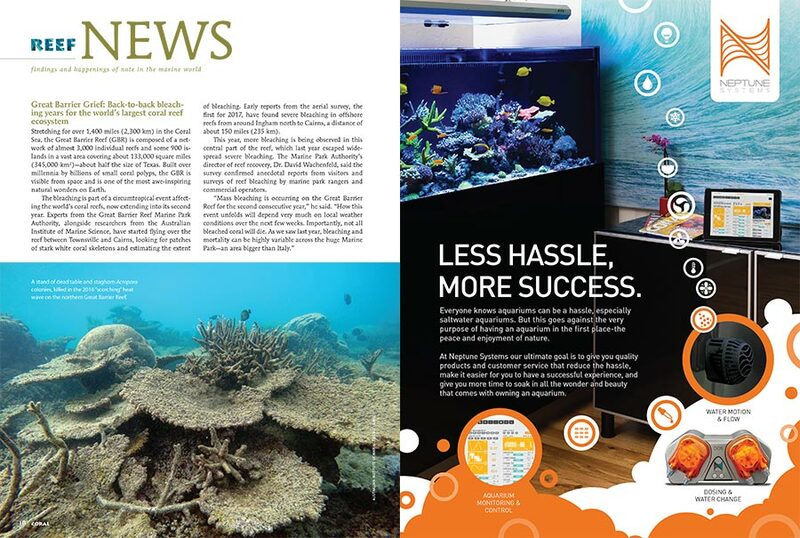 CORAL Magazine’s much-anticipated May/June 2017 Reefscaping Issue is printed and now being delivered to subscribers, local aquarium shops, and select bookstores. 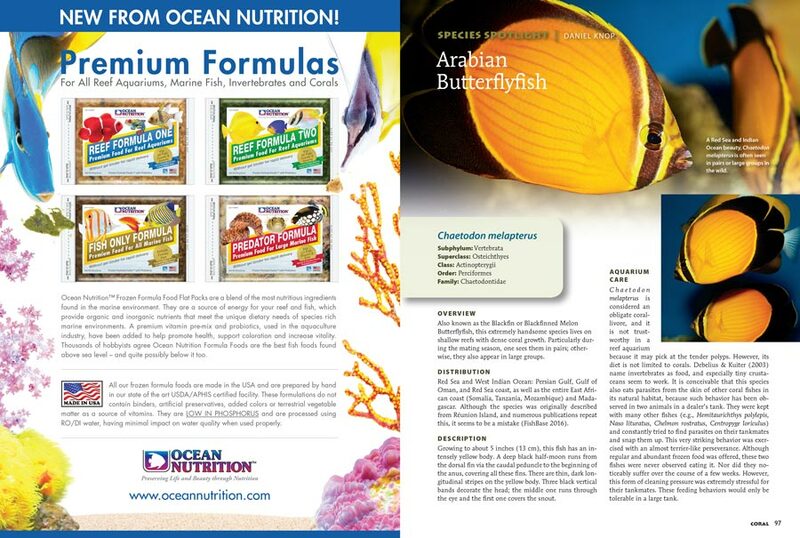 On sale date: May 9th, 2017, at the best marine aquarium retail stores and leading Barnes & Noble stores everywhere. 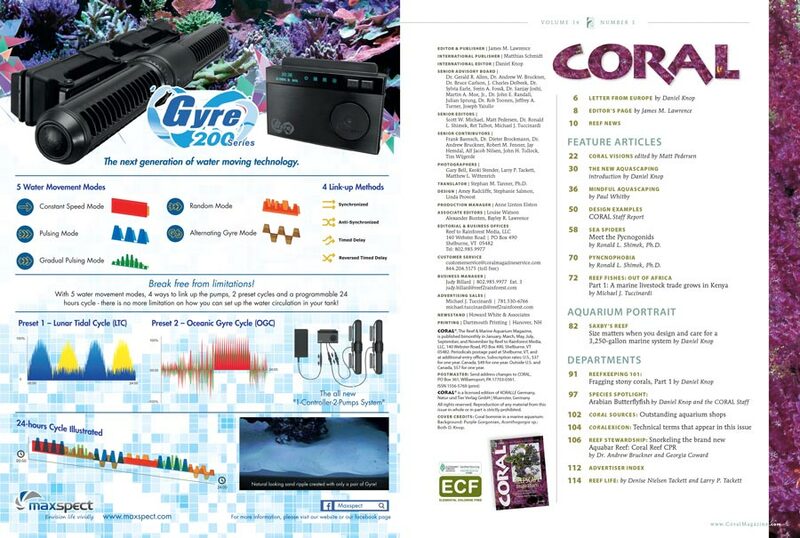 CORAL Editor & Publisher James Lawrence introduces the English-language version of the aquascaping issue and invites readers to participate in a new initiative to encourage new marine aquarists, starting with a Bulletproof Reef Fish survey. Take the survey now. Great Barrier Grief: Back-to-back bleaching years have Australian scientists fearful about the future of the world’s largest coral reef ecosystem. CORAL VISIONS opens with an unusual Organ Pipe Coral, Tubipora musica, from Unique Corals. Turn the page to see what other showstopping surprises await inside. Look elsewhere on the site for a collection of corals that were “culled” in the selection of specimens chosen to be immortalized in print. Form vs. Function and Beauty vs. 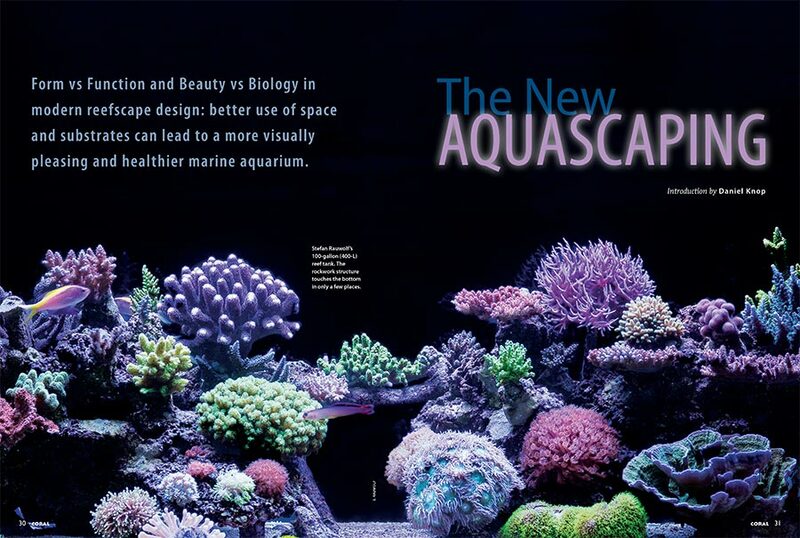 Biology in modern reefscape design: better use of space and substrates can lead to a more visually pleasing and healthier marine aquarium. 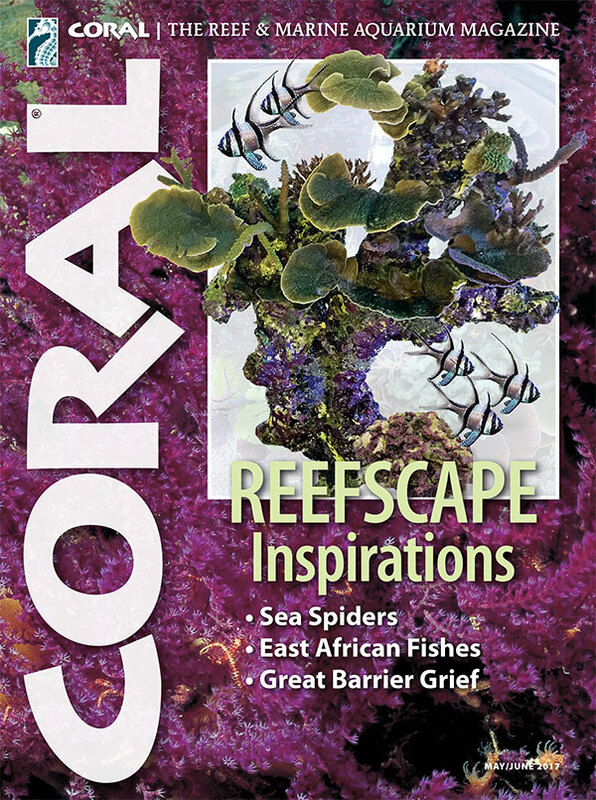 CORAL International Editor Daniel Knop introduces our cover feature series. 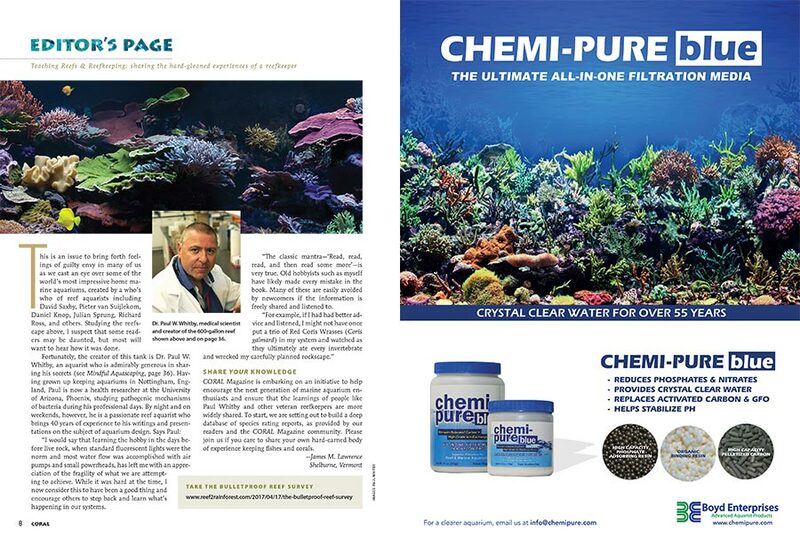 First-time CORAL contributor Dr. Paul Whitby is well known on the North American aquarium lecture circuit for his expertise in reef aquascaping. 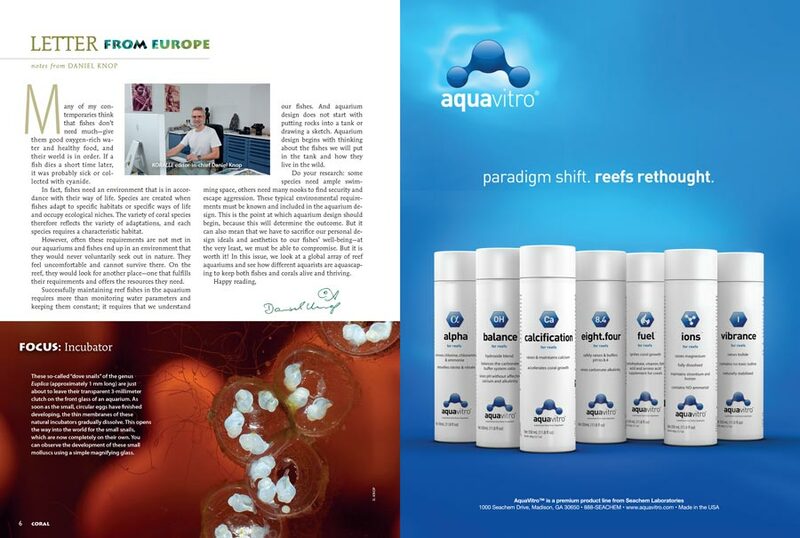 Now, we bring his insights to an international CORAL readership in his debut article, MINDFUL AQUASCAPING. 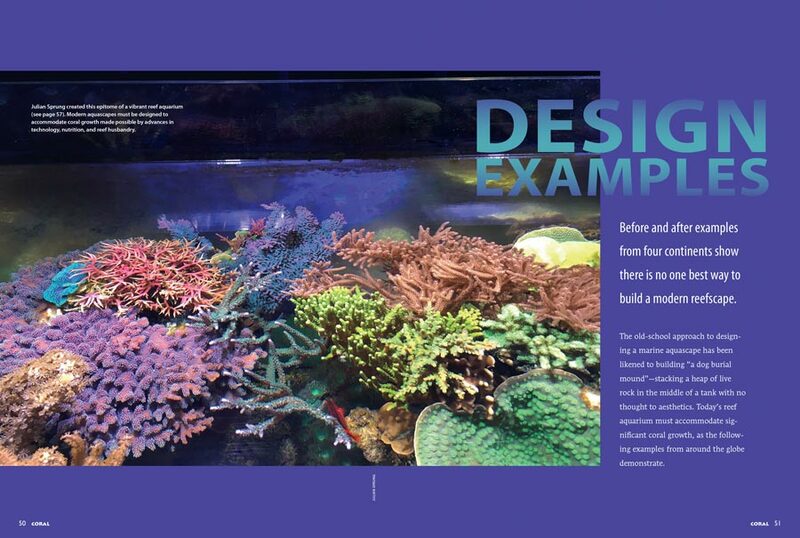 Dive into our special report, DESIGN EXAMPLES: Before and after examples from four continents show there is no one best way to build a modern reefscape. 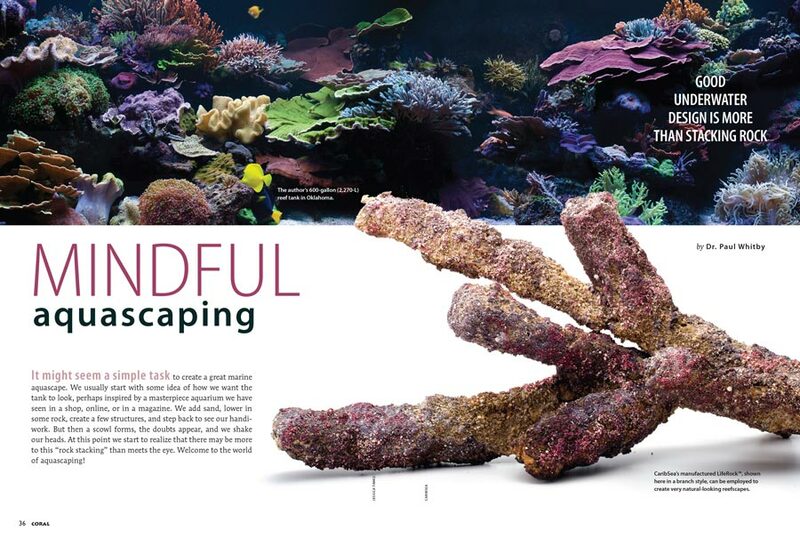 The section opens with a top-down look at a 200-gallon reef tank created by Julian Sprung of Two Little Fishies, above. Exclusively in the May/June 2017 issue of CORAL Magazine. For most of us, reef aquaria are exercises in keeping bizarre creatures, but the Pycnogonids are among the oddest uninvited guests a reefkeeper is likely to encounter. 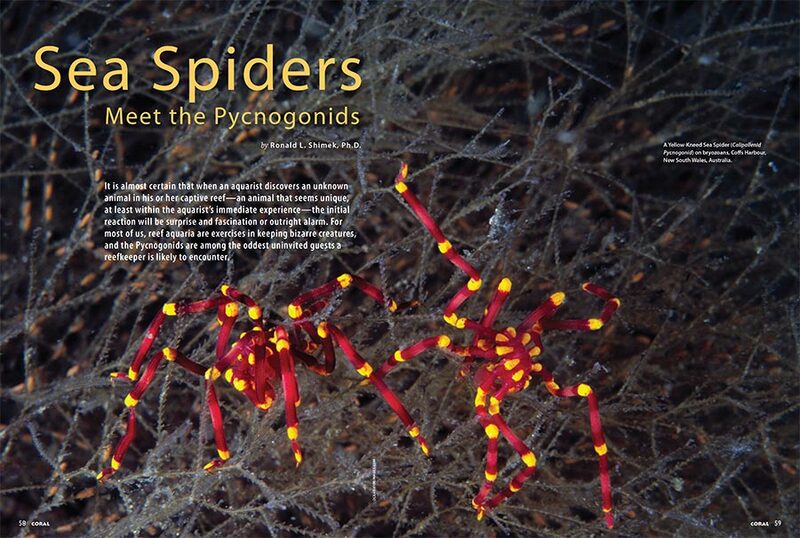 Dr. Ronald L. Shimek introduces the Pycnogonids (Sea Spiders). Pycnophobia: The fear that the sea spider I found in my aquarium two days ago, and which escaped my attempt to capture it, will sneak out from behind a coral to bite me in the finger, injecting gallons of nasty, icky, spidery poison from its huge fangs. But do reef spiders bite? 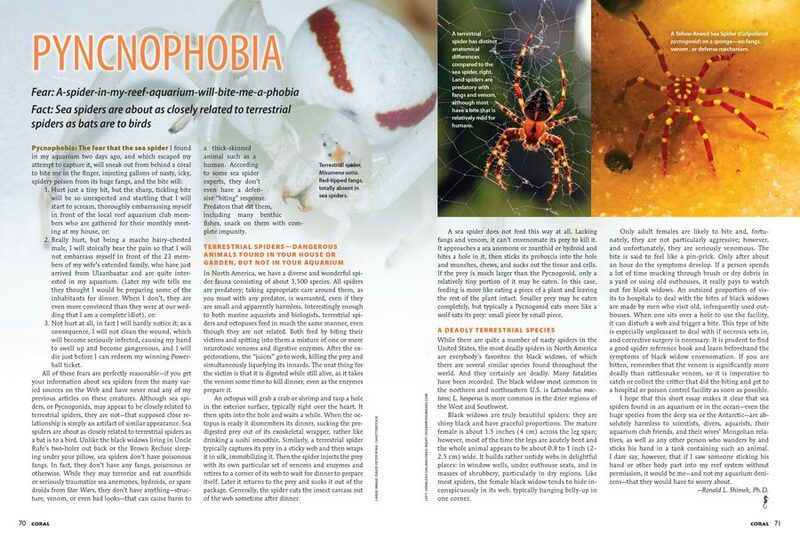 Read this memorable piece and learn the answer from one of the aquarium world’s leading marine zoology writers. 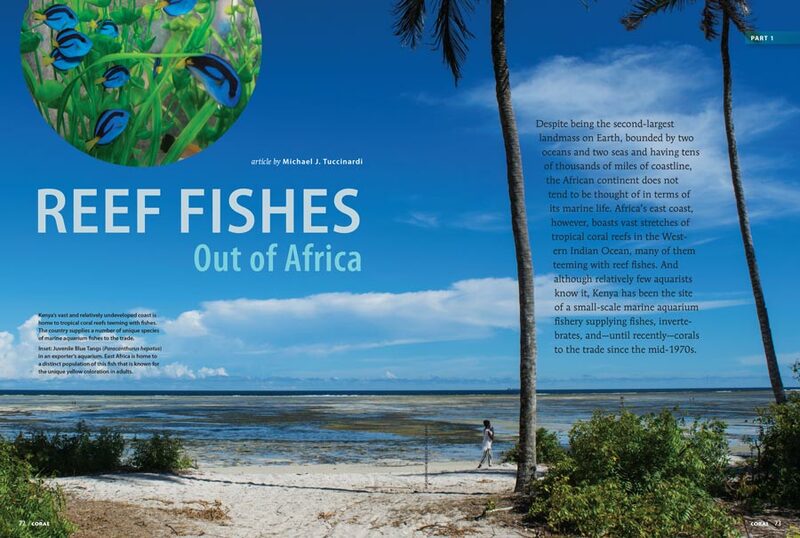 CORAL Senior Editor Michael J. Tuccinardi travels to Kenya, visits exporter Kenya Marine Center, and returns with an inside look at the east African country’s marine aquarium trade. 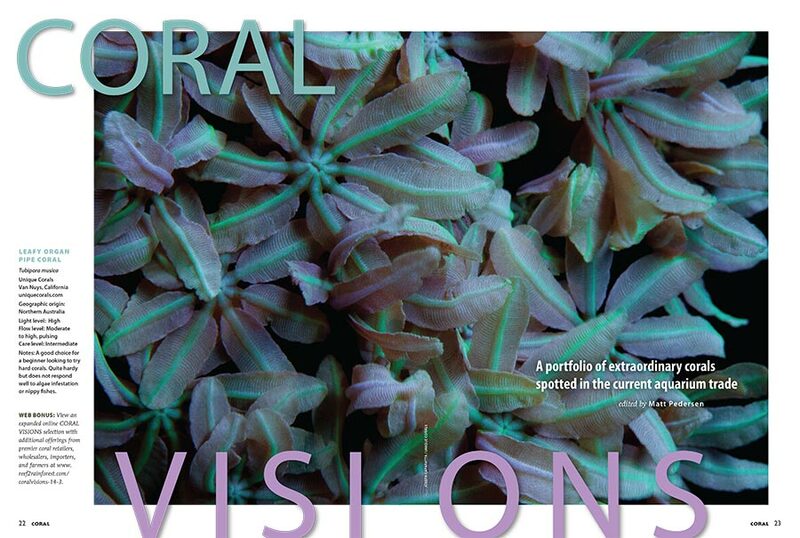 Read the first installment of the series in the new issue of CORAL. Size matters—at least when designing a majestic 3,250-gallon home reef system. 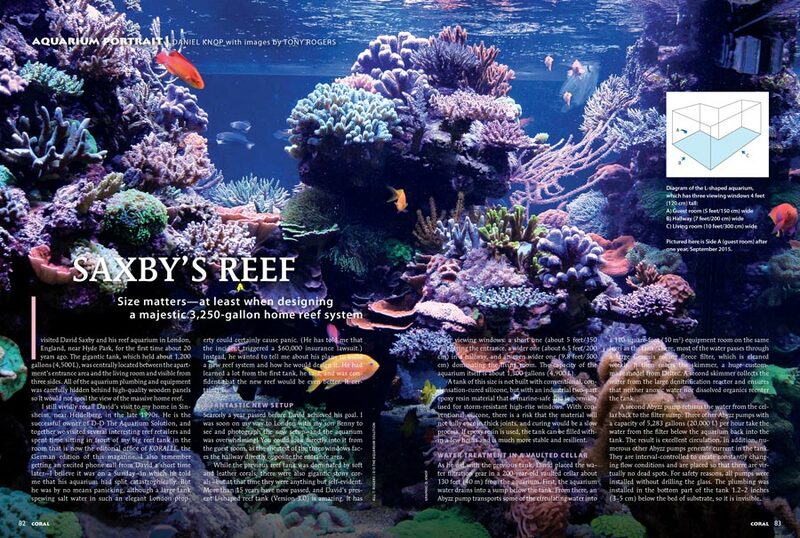 Visit David Saxby’s Reef, in the May/June 2017 Aquarium Portrait. 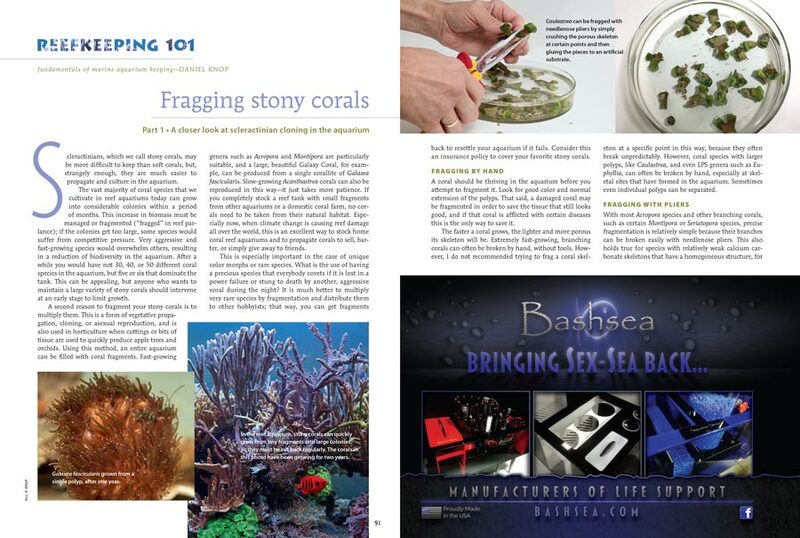 Reefkeeping 101 takes a current look at coral fragging and propagation for the beginning reef aquarist. A polar opposite to “beginning coral fragging,” the Arabian Butterflyfish, Chaetodon melapterus, is about as challenging a species as one could ever attempt to keep, the embodiment of “expert only” fishkeeping. But there are some hints of breakthrough husbandry successes in the United States. 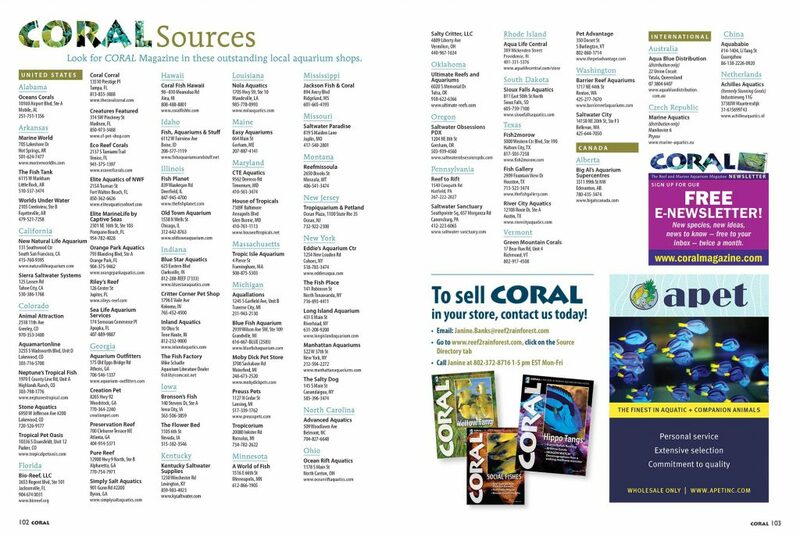 Find CORAL Magazine for sale as single issues at the BEST aquarium retailers. View this list online as well. In the wake of a devastating bleaching event, with shallow-water Acropora now a rarity, Coral Reef CPR continues reef rebuilding in the Maldives. 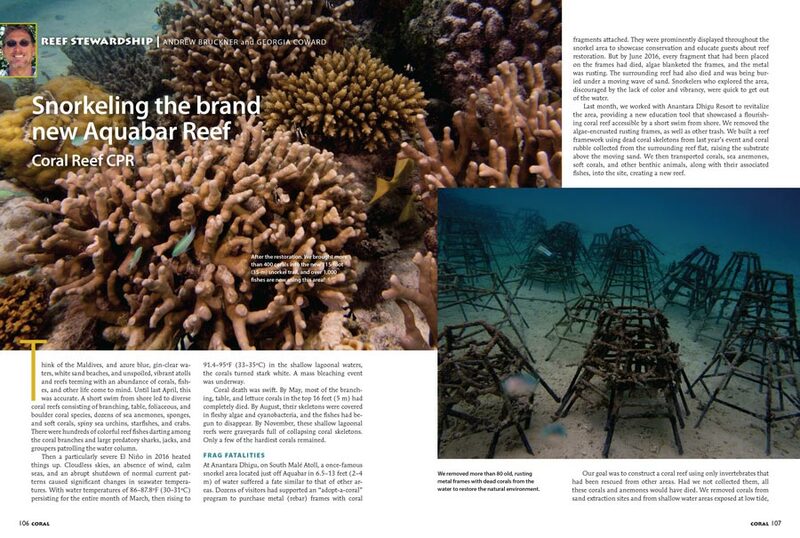 Learn more about snorkeling the brand new Aquabar Reef in the latest issue of CORAL.